Carte de l'Océan Pacifique au Nord de l'Equateur.../Charte des Stillen Weltmeers... - LOTTER, T. C.
Map maker : LOTTER, T. C.. Size : 19.5 x 22.2 inches. / 49.5 x 56.5 cm. 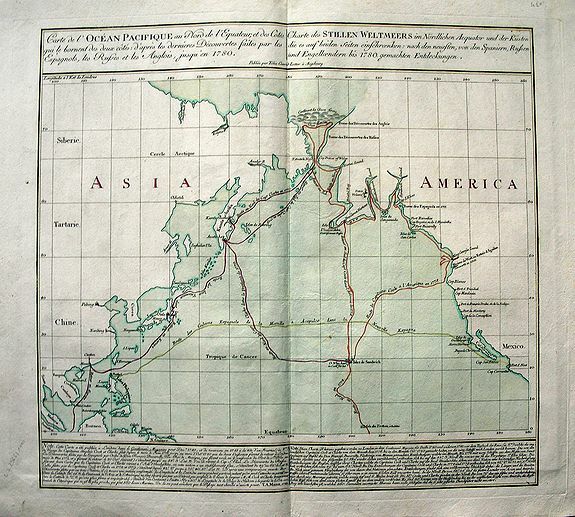 Description :Highly important map of the northern Pacific Ocean after Thomas Kitchins map of 1780. Showing the latest explorations, and the first map to show Captain Cooks third voyage, and the FIRST MAP to depict Hawaii. Additionally illustrating the routes of other 18th century explorers. With informative text in French and German below, giving dates and exact location coordinates. Condition : Excellent clean copy with superb, crisp dark impression and wide margins. Only very light soiling and one small brown spot inside image, otherwise fine & attractive condition.